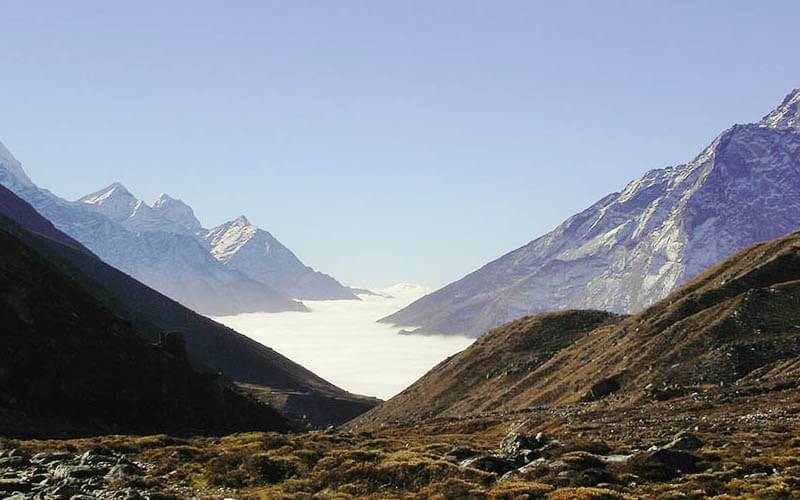 Full of excitement throughout this trip from villages, green hills, forest, landscapes and mountains, climb of Nepal toughest trekking peak Chulu West at 6,419 meters, are the main attraction and highlights of this trip, beneath world’s 10th highest Mt. Annapurna at 8,091 m and 7th highest Mt. Dhaulagiri 8,167 m, trekking beneath Annapurna and Dhaulagiri massive mountain range, dramatic variation from sub-tropic – Mediterranean, alpine to arctic climate temperature and landscapes, daily amazing panorama views with views of world’s 3highest mountains Annapurna-Dhaulagiri & Manaslu, fascinating traditional mid hills Gurung, Manang & Thakali tribe villages, super mountain panorama with a visit of holy Muktinath area. Chulu West is masterminded in a little valley and lay north of Manang, a long way from the key track to the Thorung La. Frankly; there are two Chulu Peaks-East and West. Among them, Chulu West (6419m.) is more raised one. 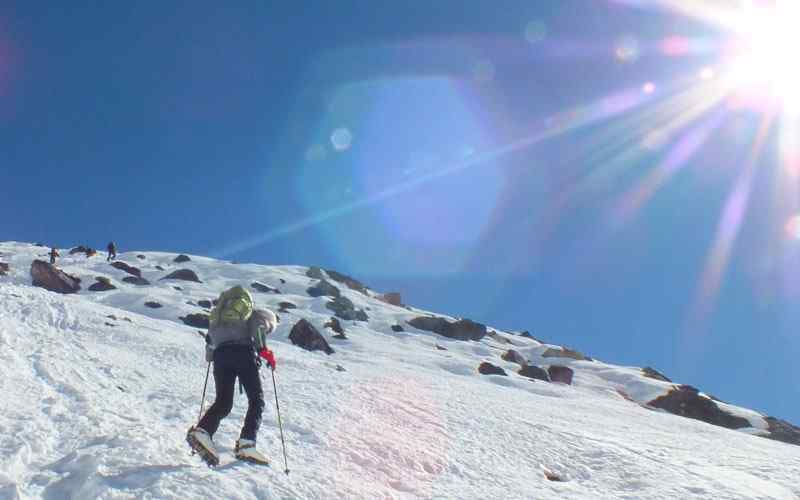 The Chulu West Peak Climbing presents an invigorating apex mountaineering elective for those trekkers who may love to go to experience involvement in the Annapurna Region. 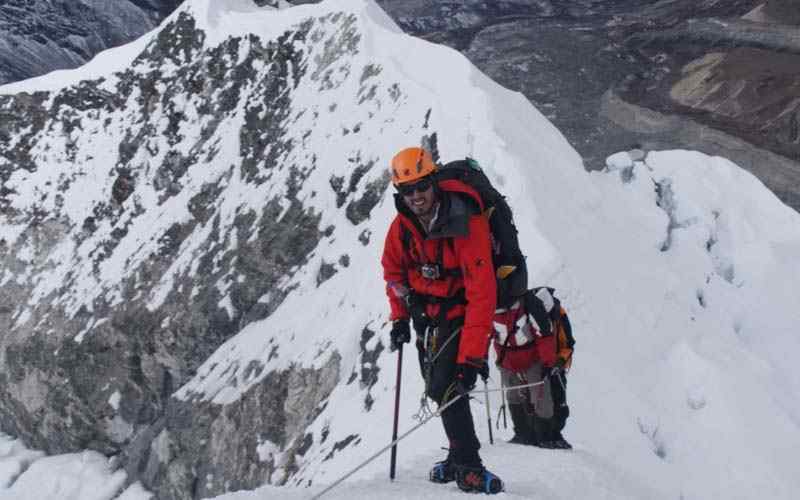 While mountaineering the zenith, we will be repaid by stunning viewpoints of apexes like Dhaulagiri, Annapurna, Nilgiri and other colossal zeniths. Also, climbing the Chulu West Peak requires an average physical condition and an irregular condition of imperativeness. Chulu West is one of the parts of the Manang Himal, which is especially consolidated into the more noteworthy Damodar Himal. In the north-to-south way we can watch the pouring of streams Nar Khola , Hunlung Khola and Phu Khola. 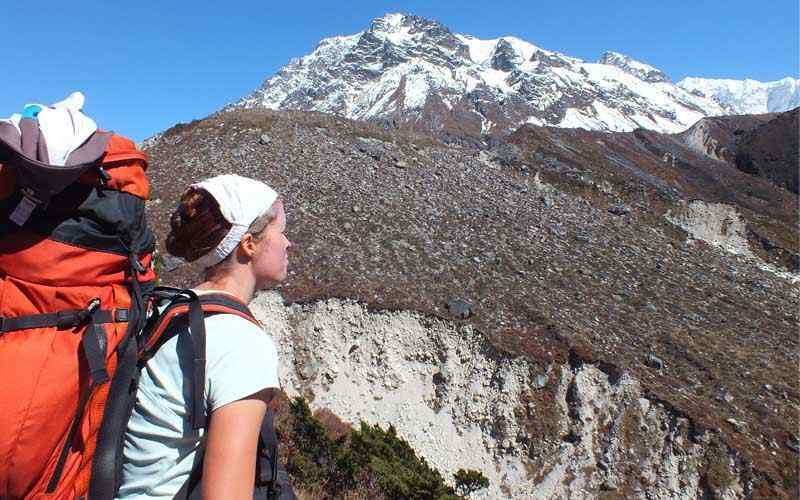 Around the south the track is encircled by the Marsyangdi Khola and the Mesokanta La. The trek of Chulu West Peak Climbing begins from Beshi Sahar ensuing to driving for 5-6 hours from Kathmandu and from Beshi Sahar the way goes up bit by bit to Manang valley, a standout amongst the most raised valleys on the planet arranged at an ascent of 5000m. Likewise, from Manang valley the way moves north to the Chulu West Base camp. 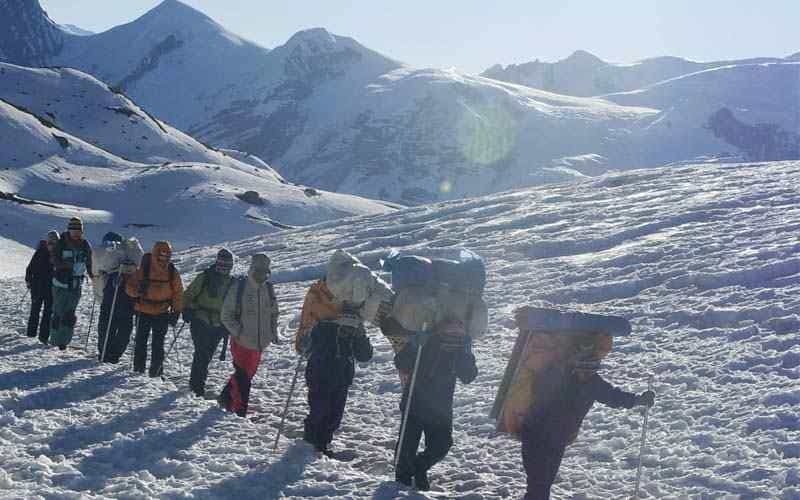 The critical highlights of the trek are experiencing the Marsyangdi valley which will entrance you with the viewpoints of Manaslu, Gangapurna, Annapurna II, III, IV and Tilicho peak; researching Gyaru and Pisang town and passing by Muktinath haven. 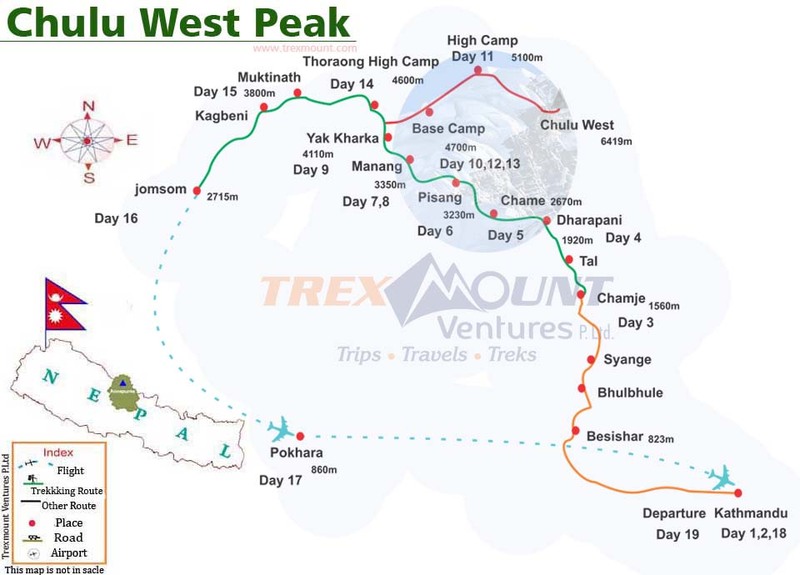 We should go for the experience of Chulu West Peak Climbing by picking Trexmount Ventures as your climbing friend. We have fantastic help group individuals who will control you through the mountains to top. 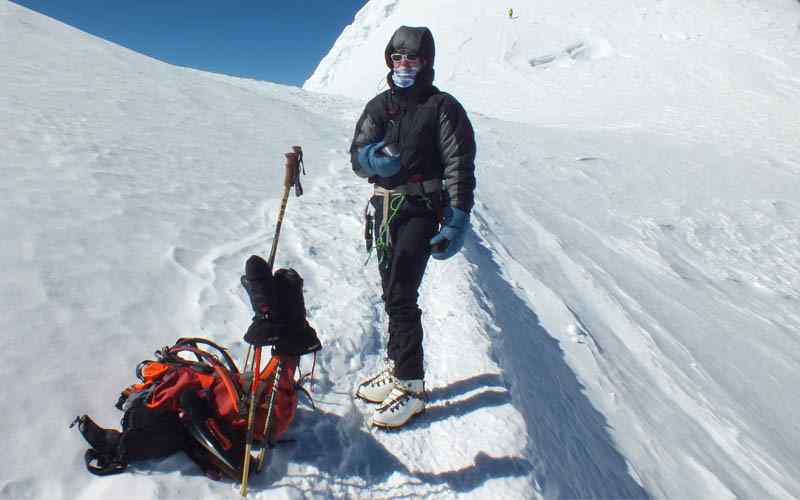 Our Sherpa team individuals have effectively scaled the world’s tallest mountain Mt. 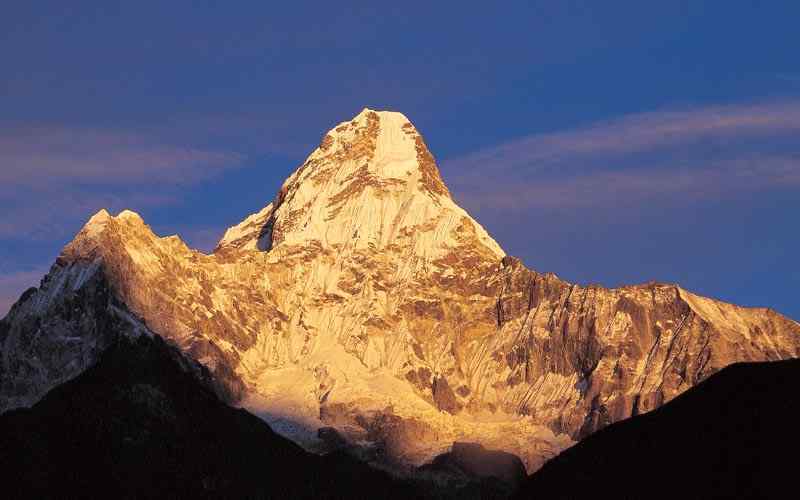 Everest (8848 m) also. 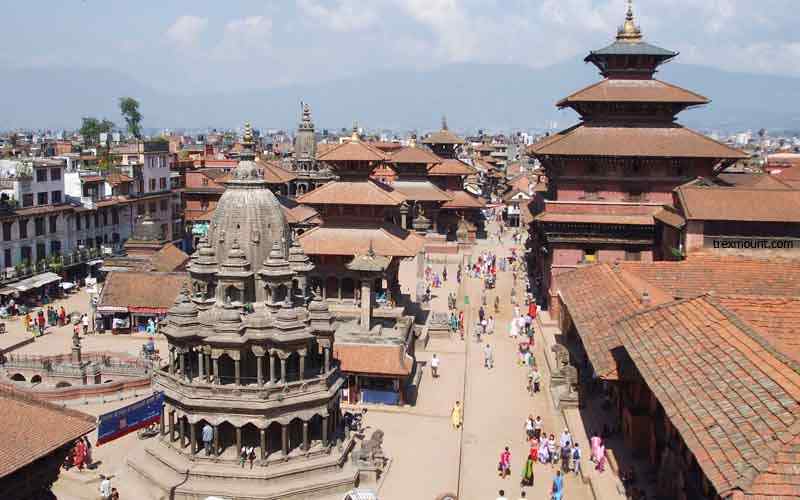 Along these lines, it would be so intriguing to do crest moving in Nepal with us. Day 03: Drive to Chamje 1,560 m-5,118 ft via Beshishar 823m-2,700 ft - 08 hrs journeys. Day 04: Trek to Dharapani 1,920 m-6,299 ft - 05 hours. Day 05: Trek to Chame 2,670 m-8,759 ft - 05 hours. Day 06: Trek to Pisang 3, 230 m-10,597 ft - 05 hrs. Day 07: Trek to Manang Village 3,450 m-11,319 ft - 05 hrs. Day 08: : Free and rest day at Manang for acclimatization. 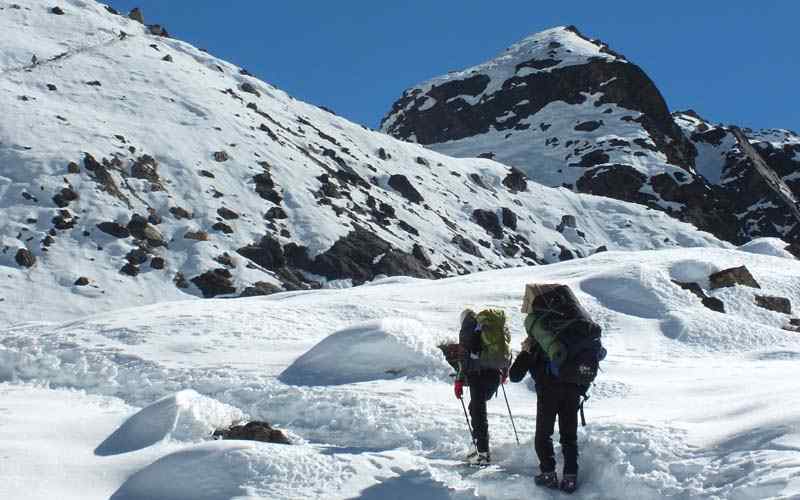 Day 09: Trek to Ledar after Yak Kharka 4,110 m-13,484 ft - 04 hours. 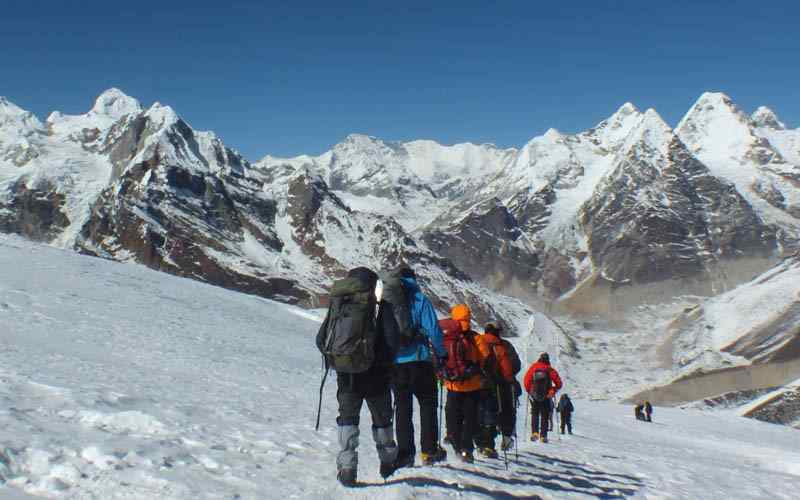 Day 10: Trek to Chulu West Base Camp 4,700m-15,420 ft - 04 hrs. 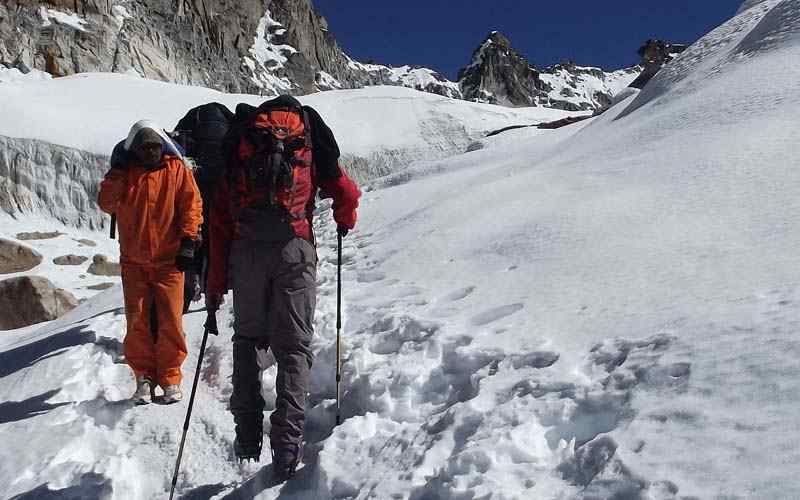 Day 11: Trek and climb to set High Camp at 5,100m-16,732 ft - 03 hrs. 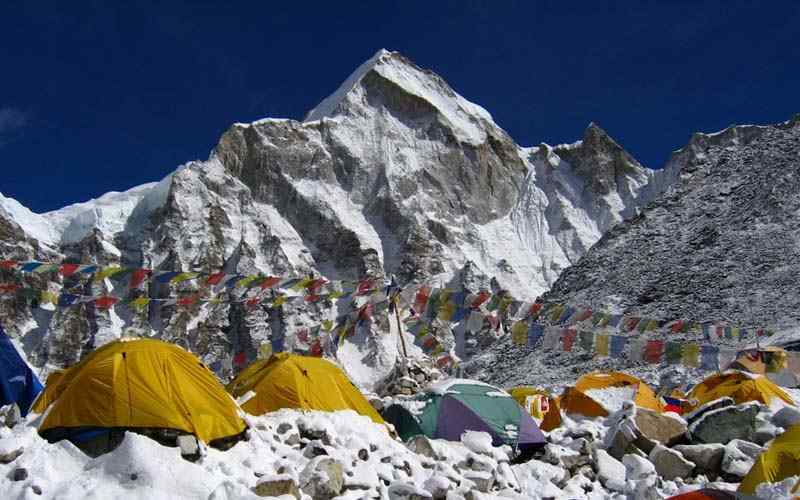 Day 12: Climbing days and return to base camp. Day 14: Trek to Thorong High Camp 4,600 m-15,092 ft - 04 hrs. Day 15: Cross Thorong-La 5,416 m- 17,770 ft and to Muktinath 3,800 m-12,467 ft - 07 hrs. Day 16: Trek to Jomsom 2, 715 m-8,907 ft - 04 hours. Day 17: Fly from Jomsom to Pokhara 860m. As time set by our guide who accompanies you throughout this trip, depart from the hotel for an interesting drive on the busy road towards Chamje via Beshishar, drive leads through Himalayan foothills and green valley’s till Dumre town, and leaving the main Kathmandu / Pokhara highway towards Beshishar a large town and headquarter of Lamjung district, from here driving on the newly built dirt road leading to Chamje via Khudi, Bhulbhule and Ngadi following the Marsyangdi River upstream, the drive continues passing rice terraces and villages and then uphill on leaving the Marsyangdi River to reach at Chamje for overnight stop via Jagat village, Chamje a small farm village with many lodges and the people from here are Manang of Tibetan origin. After a first night in local lodge with homely hospitality service, morning starts walking back to Marsyangdi River crossing and in the alpine woodlands, with super views of Annapurna, Lamjung and on the back Manaslu mountain ranges, walk leads on the wide trail to a nice village of Tal Besi, after having a break a few hours walk brings to Dharapani village for overnight halt, located on the mid way of around Manaslu and Annapurna circuit trek. From Dharapani on wards temperature gets cooler with alpine temperature climate walk leads on the winding wide trail through serene rhododendron, pine woodland through small villages of Bagachap, Danque, and then climbing higher to Timang village with super views of snow capped peaks towards North, from this village onwards in the land of Buddhist tradition and culture, an hour walk reaches to Koto and then towards Chame a large town and the district headquarter of Manang area, here with time to browse around the streets of Chame with wonderful views of AII and Lamjung Himal. From here onwards feel the cool and fresh mountain air, morning walk leads through enchanting alpine forests of rhododendron and pine tree lines following the Marshyangdi River upstream with several ups and downs to Bhratang village, after this small village walk follows uphill’s through the woodlands at Dhukure Pokhari with couple of teahouses overlooking views of Chulu’s and Pisang peak and of Pisang village, after a break here descending to reach the lower Pisang village for overnight stop, afternoon at leisure and rest as the high altitude starts from here onwards. Morning with wonderful views of snow capped peaks with close look of A II North Face, heading towards a hill through nice pine woodland where one can catch awesome views of Manang valley with surrounding high snow capped mountains, from this view point heading downhill towards Manang valley reaching Hongde village with a small airstrip, (flight to and from Pokhara is only twice a week and unpredictable), from here onwards tree lines disappears into arid and barren landscapes with cold, dry climate temperature, however gets enough sunshine during the day with strong UV in this thin air altitude. From here with constant views of snow capped peaks reaching at Braga close to Manang village, visit the old Braga monastery treasures old Buddhist artifacts, relics and stature with ancient amazing wall Thanka painting ( Buddhist religious painting) and frescos, from here breathtaking views of Annapurna range with Chulu’s and as far to Manaslu towards east, after a nice time here a slow and steady walk brings you at Manang village for lunch and overnight stop with alluring views of Gangapurna, A II and Tilicho peak and turquoise Manang lake nearby. From Pisang and at Manang houses are built in traditional Tibetan style as people of Manang practice rich Buddhism religion, culture and traditions. After a nice break and stop for two nights at Manang, morning walks is easier on the gradual path passing the last village of Manang at Tenke and then in complete wilderness with gentle uphill walk to Ghunsang village with great views of Gangapurna, Tilicho and Chulu West peaks, then slowly reaching at Yak Kharka a small settlement with full lodges and guest house with close views of Tilicho and Gangapurna peaks, after a short break walk continues just for 30 minutes to reach Ledar for overnight and lunch, this will be the last night in lodge for few days with camping facilities during climbing period with separate unit of kitchen with cook and kitchen crews. Today a short day but tough due to high altitude, morning walk follows on a faint path where few trekkers, climbers and Yak herders have seldom used. Route to base camp continues over rocks and gravel, ice and glacier to reach beneath the towering Chulu West Peak base camp is set for the climb, afternoon just relax and enjoy the view. Morning walk leads by a small glacial stream past Yak herder’s shades leading to a ridge, into a hidden valley with a good site for high camp at some 5,100 m after 4 hours of good hard walk and climb. Afternoon our guide will scout the area for safe and possible route to the summit and fixing ropes and making ice ledges where necessary. A Big Day! Our main target and destination starting before the crack of dawn as the climb leads over moraine and rubble of ice falls, following the route set by our lead guide reaching high above on an ill defined ridge towards last snow slope, most of the climb involves walking roped together, including the glacial crossings. As everyone should be fit and have good experience on this tough technical route to the summit, after a climb quite steeply with some difficulty with some technical sections on route to Chulu West summit, after a final big haul with great help and support of our expert guide. On reaching the summit take a rest and admire the beautiful panorama of whole Annapurna Mountains and towards north and west Chulu range with Damodar peaks as well beyond Chulu peaks, view of Manaslu towards east horizon. 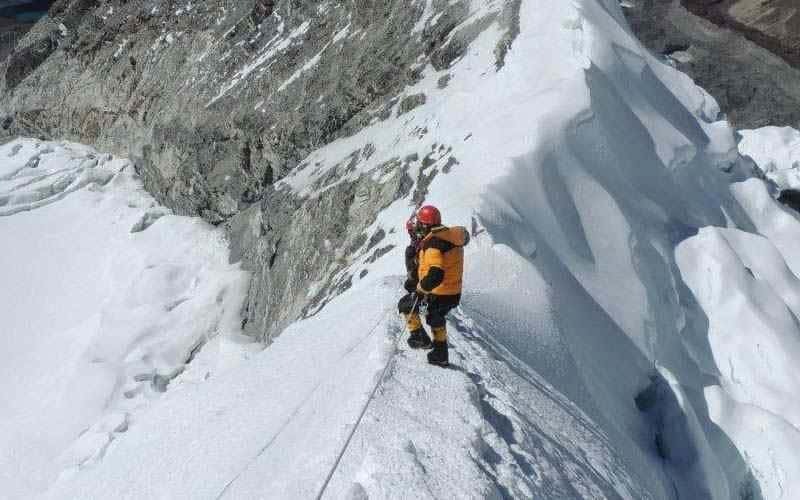 After being in the highest spot of this adventure descent by same route to base camp, as time permits and possible with physical strength after the climb descend all the way to base camp or to Ledar. We have a spare as contingency / reserve day in case of bad unusual weather situations, if all goes well as per the designated itinerary days our guide will make the decision after informing all, how and where this spare can be used before or after Thorang-la on route Jomsom. Slowly and steady journey gets closer to another highlights and highest elevation of the trek at Thorang-la pass, walk is pleasant except for the altitude the trail follows crossing a bridge after Ledar and then a short steep climb after the river reaching at Jarjung around this place chances of seeing some wildlife like Musk Deer, Himalayan Thar, Mountain Goats or the rare and elusive Snow Leopard if lucky. Walk then reaches at Thorang Phedi (base of Thorang-la), after a break here walk on the scree zig zag slope path which is quite steep for an hour till High Camp is reached for lunch and overnight stop.A great place with super views of Gangapurna, Damodar and Bhirkuti Himal and range of snow capped peaks. Starting quite early after breakfast to reach the top of the pass earlier before the cold wind catches with chill factors, the walk is gradual with ups and even trail most of the way and then slowly with a climb reaching the highest point of this trip and one of the highlights at 5,416 m / 17,770 ft high, the pass is festooned with hundreds of Buddhist prayer flags and with sign board ‘Thorang-la’ and its heights, this place with awesome views of snow capped mountains looking over West at Dhaulagiri, Mustang Himal as well. After a great success, with great moment descend a long way to reach the bottom with few teahouses to refresh and for lunch before setting towards Muktinath for overnight after a long hard but interesting and adventurous day. 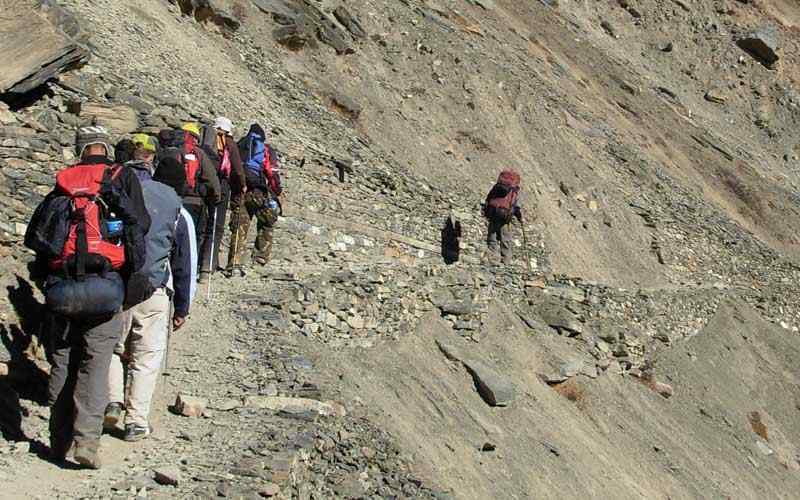 The walk to Muktinath is pleasant for few hours, on reaching at Muktinath check into respective nice lodges for overnight stop and nice rest. This place is a holy for both Hindus and Buddhists the word Muktinath literally means ‘the place for Nirvana or Liberation’. After a long walk of previous day, today the last day of trekking leading on a pleasant trek on the downhill path passing Jharkot village with a drop of 1,200 meters to Kaligandaki river bed, on reaching the wide Kaligandaki River valley at a small place of Ekale bhatti, continue walk on the flat wide valley for few hours reaching at Jomsom, head quarter of Mustang area. Jomsom with an airstrip above Kaligandaki River (operates daily morning schedule flight to and from Pokhara). At Jomsom enjoy the afternoon exploring the town and having the best of apple products as Mustang area is famous apples. Today the last day in the high hills and mountains, morning transfer to Jomsom airport for the sweeping flight to Pokhara with alluring views of Dhaulagiri, Nilgiris, Annapurna and Machhapuchhre, this wonderful flight taking less than half hour to reach at Pokhara for overnight stop by the pristine Lake Phewa, time in the afternoon to browse around the lake side stores and shops and relax in this beautiful setting.